This trophy has been established during 2012 in honour of William Boyle (26/10/1989 - 20/10/2011), an outstanding young referee who tragically lost his life in 2011. Will was an extremely promising referee who as a 21 year old refereed the Premier Division 2nd Grade Grand Final in September 2011. 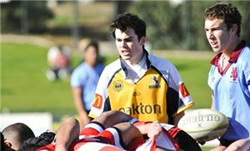 Will started refereeing while he was a student at the Canberra Grammar School, and showed his potential early in being awarded the School Student Scholarship in 2006 and 2007 and being consistently appointed to 1st XV matches whilst in year 12. 2007 also saw Will win the Bruce Portway Whistle for achieving the highest marks in the Level II Referee course and field test. In 2009 he was selected to go on referee exchange to Waikato and completed a successful year winning the B.A.R Trophy for the ACT’s most improved Referee. In memory of Will this trophy is awarded to the ACTRRA’s Most Outstanding Scholarship Referee. To be eligible for this award the winner must be a part of the ARU School Student Scholarship Program for up and coming referees.